So you are thinking of buying a new bed? 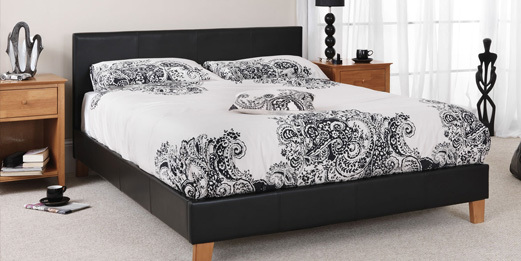 If you have had your existing bed for a good few years you’ll soon be glad you are investing in a new one. Not only can a well chosen bed transform your bedroom and improve its appearance, it can also give you a much more restful and contented night’s sleep. Before you make that all important purchase though, it is important to ensure you make the right decision on which bed to buy. Consider these important points to ensure you’re delighted with your purchase. This is usually the easiest question to answer. For example you will know whether you want a single or a double bed. You will also know whether the bed is intended for an adult or a child. If you want a double bed for two adults you then need to consider whether to get a standard double bed or something a bit more generous, such as a king size bed for example. Before making your decision always measure up the room the bed is intended for, to ensure you can fit it in. There are lots of different types and styles of bed available to choose from. The two basic types are the divan bed and the frame bed. The divan has a divan section underneath the mattress. This can come with or without drawers. If you decide to order this type of bed make sure you look to see whether it comes with a headboard. You may have to buy this separately, but if you do you will have a nice choice of headboards that you can choose from to ensure you match the bed to the rest of your decor. The frame bed can be made from a number of materials such as wood, metal, leather or a combination of two or more. The mattress then sits on top of the frame once it has been constructed. Most bed frames are fairly easy to put together, although the job is made much easier with two people. You can also buy mid or high sleepers that position the bed off the ground, providing a ladder to climb up to it. These are ideal for an older child and also for bedrooms where space is at a premium. Once you have chosen your bed style you now have to choose your mattress. Foam and memory foam mattresses are becoming more popular now and you will find a large selection of them to choose from. Alternatively you can get a sprung mattress, of which there are several types, including pocket sprung and coil sprung mattresses. You will also need to consider how firm you want your mattress to be. If you like a fairly firm mattress you might benefit from an orthopaedic one. So there you have it – some essential tips for choosing a new bed. As you can see, with a little thought you can be sure of choosing the best bed for your requirements.